All the current orders for the Drew ][ TDX have been shipped. I still have a couple left if anyone wants one. I am still amazed that after all these years I still find new bits of software for the GS that i haven’t come across. 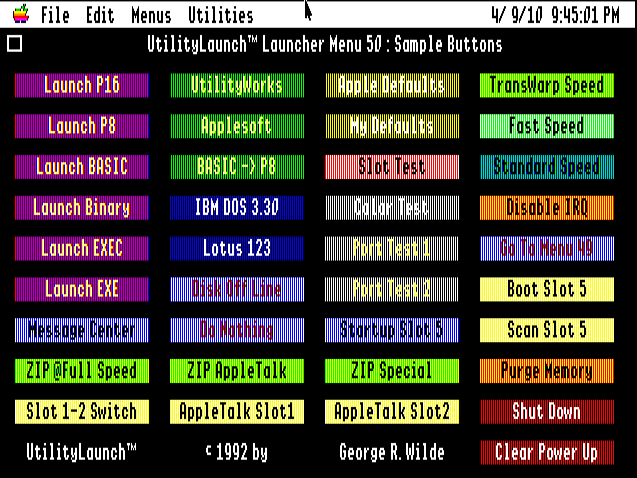 UtilityLaunch is an application launcher for the GS. It can run independently or replace START as your initial program when you boot to GS/OS. It provides upto 50 seperate Menus containing 40 small buttons or 16 larger ones with custom icons. The program seems very customisable and you can configure slot changes as well as Transwarp GS and Zip GSX Speed changes for applications that you launch. I found it a bit confusing initially to create and edit menu/button settings, but once you get used to that you will be creating custom layouts before you know it :). The documentation mentions installation scripts that can be used with GS/OS installer, but I was not able to get this work and just complained about no path. In the end I just copied the UTILITYLANCH program and UL.MENUS files to the System folder. I then renamed START to STARTOLD and UTILITYLAUNCH to START. You should also be able to use SetStart control panel as well. There seems to be plenty of documentation for it (check out documentation at apple2online, they also have the passwords to unlock the shareware versions of the products as provided by the author) and If you are after a new launcher then I would recommend you check it out. Up to finding UL I was using Wings 1.0.4, but think I will now stick with this. This was all tested in Sweet16, but worked fine on my ROM03, with TWGS 10Mhz and 4MB Ram. Well with the release of the pricing and the discussion going on over at CSA of the real GS laptop it made me think of one of my projects a few years ago to put together a “GS EmuLaptop”. I thought it would be useful to post for anyone who likes the idea of a GS portable, but struggles to justify the price tag of a real one. 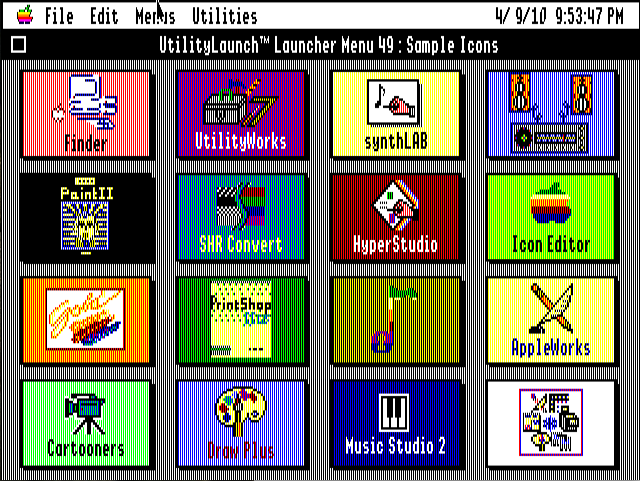 The goal at the time was getting something together which had the feel and usability of a real GS. Bernie ][ the rescue 3.0 is the most complete Apple IIGS emulator (imo) and this was the emulator i wanted to use. Obviously this means Classic Mac OS only, but this was fine as the laptops i was looking to build the emulaptop would be able to run OS 8 (best support for Prodos disks). 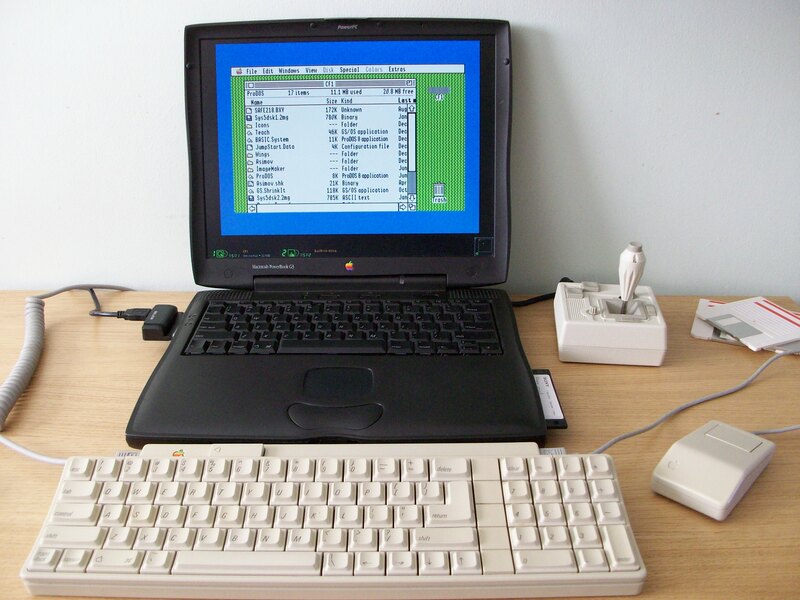 In the end I decided that the Powerbook G3 Wallstreet 2 range was the right laptop. The second hand price of the laptops were about £50 on ebay UK and were modern enough to run some older versions of OSX (upto 10.3 I think) and get internet access. The Powerbook G3 is also very easily upgradable/maintainable and you can upgrade RAM and HD much easier than the later ibooks G3s. The Wallstreet 2 allowed for the use of the GS keyboard and mouse (make it as authentic as possible), could read real 800k Prodos disks and with a USB/PC GamePort adapter i could also use my favorite joystick ( a CH Mach3 – you could in fact use any PC joystick here). Lombards and Pismos would also work but I wouldn’t have got ADB support/800k Floppy Support. With a Compact Flash Adapter (either PCCard or via USB adapter) you can boot directly of a real CF card from a CFFA board (or similar) on the emulated GS, though only the 1st partition is usable. One benefit with Bernie over other emulators is the ability to calibrate joysticks that are attached. Bernie can support the Gravis Mouse Stick 2 as well as usb joysticks via Sprocket support. If you are a game player then keyboard doesn’t always cut it. This was all done with a minimum of cost. Edit – I will add that yes having a keyboard and mouse doesn’t make it that portable 😉 and after using Sweet16 last night with its networking feature on my laptop it is very handy when you want to have a play (for gaming I will stick to the above for best experience bar real GS). Thanks for everyone who has bought one. I plan to ship all the cards out end of next week. I am just waiting for some packaging to turn up, so please bare with me. Thanks for all the prompt payments. You are currently browsing the Drew ][ blog archives for April, 2010.